Legendary Zimbabwean musician Oliver "Tuku" Mtukudzi passed away on Wednesday in a hospital in Harare at the age of 66, his manager said. "He died this afternoon at a private hospital ... The funeral arrangements will be announced in due course," Mutukudzi's manager, Walter Wanyanya, told news agency DPA. Mtukudzi was a prolific musician, putting out over 60 albums in his 45-year career. His songs were a distinctive blend of Zimbabwean and South African rhythms that were known as "Tuku music." 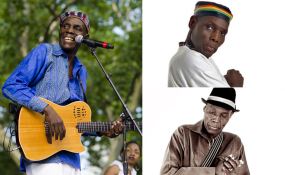 Mtukudzi was also known for singing in three of his country's languages -- Shona, Ndebele and English -- and for featuring traditional Shona instruments such as the marimba and mbira.